I’ve been to Tours in France. For picking up my sister at the Euro Gusto. This is an exposition comparable to the Slow Food. OK, I’ve to admit it’s not very reasonable to drive 1800 km in 3 days just for having a look at some wine and tasting some smelling cheese. But I like France and it was definitely good to away from work for some days and I had the possibility to correct some of my prejudice about French people. They tried hard to understand my bad French and did not ask for every word I’ve pronounced in a wrong way and they even tried to talk German to me. 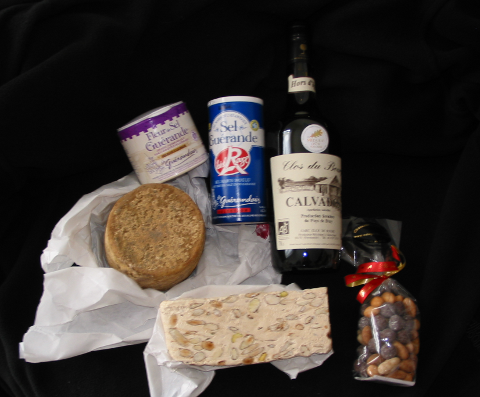 The picture shows the things I’ve bought there: cheese, calvados, almonds, fleur de sel and nougat.